When Mark checked the status of the expected American Airlines flight, it appeared to be cancelled! A big thunderstorm in Miami, our visitors’ stopover, prevented all planes from landing and taking there. Our visitors’ whole trip was up in the air, literally and figuratively, and we could only hope for the best. It worked and they did arrive in St. Maarten the same day, with a five hour delay and without luggage! Waiting in line and filing the necessary forms took another two hours of their precious vacation time. Around 10 pm, Mark, Darwin and I welcomed Tim and Kristen aboard Irie. Since we had to wait for the luggage to arrive, plans changed a bit for the first day of their holiday. Instead of leaving the lagoon in the morning and exploring Friar’s Bay and Happy Bay, Mark and Tim had their big business meeting and the girls went shopping in Marigot, the capital of St. Martin. By late afternoon, the guys tried to obtain the arrived luggage, which proved to be a painful and inefficient two hour process. This is the Caribbean! They made it back on Irie right in time to catch the last bridge opening of the day on the French side. We did succeed to anchor in Grand Case before the sun set. In the evening, we tried the local BBQ shacks (lolos) for dinner, something Mark and I came to like. Unfortunately, the over-cooked food, depletion of choices and unfriendly service made an end to that tradition. 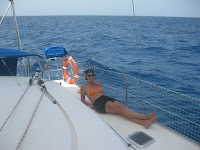 On Wednesday, a short, pleasant sail brought us to Tintamarre, where a pod of sleeping dolphins drew our attention. This is the first time we noticed these wonderful animals being totally motionless, just floating under and above the surface. Free mooring balls in the anchorage made our stay easy and a swim to the beach rewarded us with remoteness and white sand. A path leads to the windward side of this deserted island, where the water was lukewarm, protected by the reefs. Snorkeling around the rocks was fair and tiresome because of a strong current. The water was as clear as the sky. 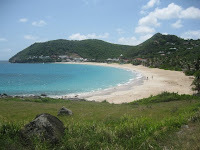 From Tintamarre we had a slow sail to Anse du Columbier in St. Barth. Since the plotted course was straight into the wind, we needed a few tacks and a lot of time to reach our destination. We had lunch underway and the last half hour we decided to motor. Once settled on a free mooring ball, we could enjoy the peaceful surroundings, beautiful water and many sea turtles grazing around our boat. The rest of the afternoon and evening was quietly spent in the anchorage with a nice meal and good company. Friday had arrived and since we planned two nights in Columbier, we had a whole day to enjoy the area. Kristen preferred to check out St. Barth’s capital Gustavia, so the four of us and Darwin walked the hot, but pretty trail towards the small village of Flamands. There, a taxi could get arranged to drive us into the town center of Gustavia. Tim and Kristen went shopping, while Mark, Darwin and I hung out in the shade of a gazebo, where free internet is available and where we ran into Chris from Gypsy Cat. It’s a small world! For lunch, the Kiltys walked to Shell Beach, where a fancy and attractive outdoor restaurant is located. Tim and Kristen treated us to a wonderful lunch and Darwin got offered a bowl of fresh water. After a sweaty walk back to the dinghy, our guests snorkeled and enjoyed the clear water and interesting sea life. Just like the previous nights, we were all tired and spent by 9pm after a day full of activity and strong sun, so we turned in early again. The following day, the alarm clock got us going. A quick breakfast and the sails went up for a last sail back to Simpson Bay Lagoon. The wind was very light, which made the trip slow but relaxing. We had to hurry a bit in the end to make the 11:30am Dutch bridge back into our oh-so-familiar lagoon. 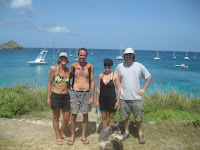 During the afternoon, Tim, Kristen and I took a bus into Philipsburg for more shopping. 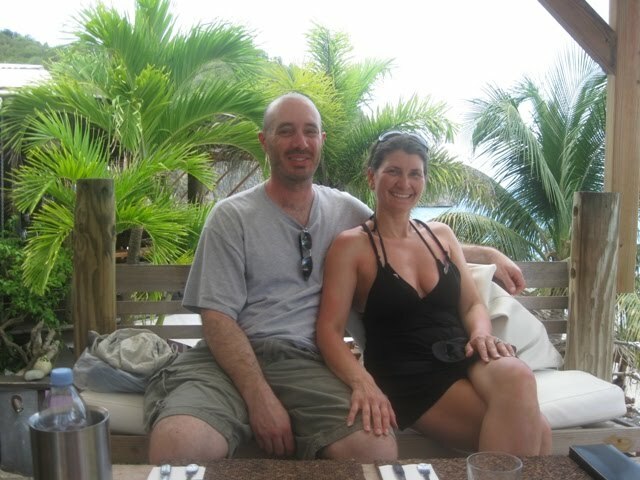 At night, the couple took us out to a seafood restaurant along the water. The food was delicious and a huge spoil for the two of us. A very enjoyable, tasty and stress free last night wrapped up our family and Wirie meeting in the Caribbean.